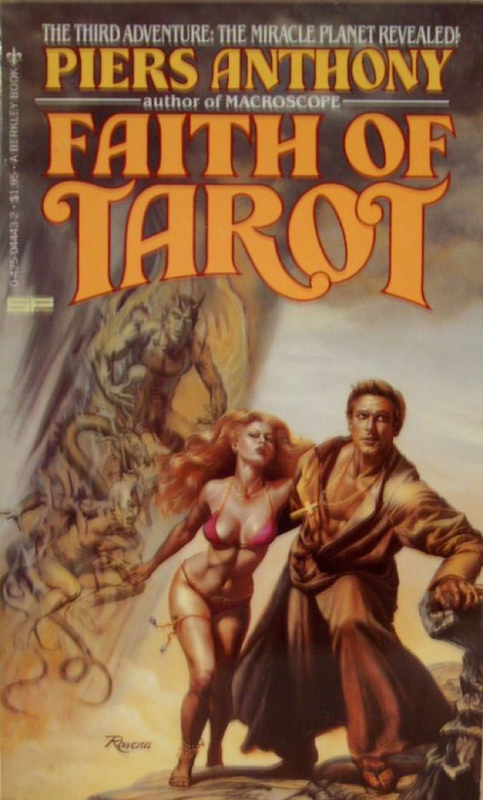 Hermetic Library Fellow T Polyphilus reviews Faith of Tarot by Piers Anthony. This final volume of Piers Anthony’s science-fantasy adventure Tarot overtly ties it in to his “Cluster” novels (which I haven’t read). It supplies a fanciful historical origin for the tarot among the Waldensian heretics of the fourteenth century, as foreshadowed at the start of the first book. In this multi-chapter medieval passage, there is even a feint at the Sacred Magic of Abramelin, as the hero Brother Paul meets Abraham of Worms. But the augoeides doctrine does not appear in Anthony’s work, despite the persistence of “Love Is the Law, Love under Will” (sic, with impertinent capitals). The solution of the “God of Tarot” conundrum comes three chapters before the end, leaving a long unwinding denouement to address the fates of the various characters. By the time the revelation arrives, it’s not much of a surprise, but I won’t spoiler it here. The further explication of various psycho-sexual motives (particularly for the Crowley-derived character Therion) were not terribly convincing, and the final resolution was perhaps too tidy. I’m satisfied to have finally read these books, and I can recommend them for light entertainment. But they seem to pretend to a profundity that I think they lack. Each chapter is headed by a long epigraph, and these often set a tone of sage contemplation. There are metatextual references to medieval dream-visions and the chapter sequence is keyed to the tarot trumps. Perhaps it would be an effective “gateway” work for readers with no prior education in occultism, but its take on esoteric materials is very idiosyncratic and supports its own fiction better than it would any factual efforts. As evidence, the “Animation Tarot” variant (with its hundred-card deck of thirty trumps and five small suits) appears never to have been executed or published in the decades since these books were written.